• 605 color and black-and-white illustrations, including 135 color thangkas. • Includes more than 20 psychoactives never before documented. • The result of 18 years of field research. The Himalayan kingdom of Nepal may be the only culture in the world where both shamanic and tantric techniques are still alive and in full practice today. The result of eighteen years of field research, Shamanism and Tantra in the Himalayas presents for the first time a comprehensive overview of shamanism that is based on the knowledge and experience of the different tribes from that region. Included are original statements from the various ethnic groups and 135 color thangkas, which act as visual guides to the specific practices of the tantric tradition. In addition to the thangkas, the book is lavishly illustrated with numerous photos of different shamanic healing ceremonies, ritual objects, and culturally significant plants that have never been published before. The book also contains a wealth of original recipes, smoking mixtures, scientific tables, charts, and descriptions of more than 20 plants whose psychoactive properties and uses by shamans have never before been researched or documented. "The way of the shamans is the way of love." Despite all of their ethnic differences, Parvati Rai, Mohan Rai, Maile Lama, and Indra Gurung are united in this belief. As healers, they act in accordance with the ideal of transforming hate into love, jealousy into generosity, and ignorance into humility. With these three fundamental evils, which manifest as gnawing diseases, the shamans' magic number of three is encountered once again. Keep in mind that these three steps of diagnosis, therapy, and cure are merely an idealized progression. Because it is so easy to say (or write) but so difficult to fulfill, the shamans shall never become jobless and they must work for their lifetime on their own selves. They are only human. Jhankris become sick just like everyone else. They have burdens like we do, and fall as happily and as easily into their own traps. When they are in a trance, however, they are connected to a source of power which is only available in extreme situations in normal life. "When I cross the street I am afraid that I might be run over. But if I had fear of the dangers lurking in wait for me, I could not go into a trance," said Maile Lama with a laugh. The mission of bringing love, harmony, and peace to the hearts of patients who have been made sick by the gnawing poisons of hate, jealousy, and ignorance (regardless of whether it was generated in the breeding ground of the patient's own personality, or through poisoning by other people) cannot be fulfilled by someone who wears rose colored glasses. This assignment is no easy task. It requires the critical examination of uncomfortable truths, and necessitates encounters with dangerous adversaries. Many Jhankris are not capable of rising to the task. They escape into alcoholism or become "chicken shamans," or "professionals" in order to make their lives easier and to earn more money. A person who bluffs his way through as a "chicken shaman"--using sensational fire-eating displays, fantastical costumes, unnecessary animal sacrifices, and huge tom-toms--is not a Jhankri. Neither is the person who opens a practice with fixed office hours and a regular income. Again and again we heard from the Jhankris, who can swiftly see behind the façade of their false colleagues, "Chicken shamans and 'professionals' are not shamans." This may seem odd to us. As members of western consumer societies, we might ask ourselves: why shouldn't a Jhankri make a profitable business from his abilities? Why shouldn't he or she open a regular practice like a doctor and earn money from it? The stunningly simple answer to our questions was, "Because we Jhankris are not permitted to advertise ourselves. We are only dhami Jhankris because others are healed by us, and not because we say that we can heal them." Only the person who can heal is a Jhankri. Every Jhankri is a dhami, a healer, but not every dhami is a Jhankri, because only a Jhankri falls into trance; a dhami, on the other hand, is not able to do so. No one in the Himalayas becomes a Jhankri because they choose it as their profession. One is called upon to become a Jhankri. Many go out of their way to avoid the calling because it will mean a difficult life of deprivation. Shamans are just ordinary humans. They are farmers, craftsmen, mothers, housewives, factory workers. And in addition to this, they shamanize when someone comes to them who needs their help. Many patients leave nothing behind for them other than a few words of thanks. Others bring a small bag of rice or leave behind 10 to 15 Rupees. Whenever we saw "our" Jhankris on the street, we always asked ourselves whether or not anybody realized that the plain woman wearing a traditional cotton sari and flip-flops, or the man with athletic pants, a shirt, and a baseball cap, was actually a powerful healer who battled demons at night and took on the nature and mannerisms of animal spirits. Just as the forces of nature rage, so too do the Jhankris often rage in their chintas (healing ceremonies). They call authoritatively for their helping spirits and then they send them away again when the trance is deep enough. The encounters with the forces beyond are reflected in their sweat-covered faces. They laugh or roll their eyes, roar or call out. No matter how deep the trance and how terrible the encounter is, no matter how ecstatically they convulse or spin in front of their altar, the Jhankris are always in the position to direct their journey through the three worlds and to control the trance. Often the diagnoses that they make while in the trance, bring back to the realm of normal consciousness, and announce to the patients are ruthless. We heard things such as, "There are hypocrites in your environment," or, " I have seen that you have often lied to your family." There is no trace of "gentle healing." The Jhankris take what their patients have carefully buried away, or repressed into their sub-consciousness, and lay it out on the table. At the same time, only what concerns the patient's current life is relevant to the diagnosis. For the person who has had a difficult childhood but is leading an overall happy life as an adult, the fears and anxieties do not resurface. Surendra Bahadur Shahi was born in Kathmandu into a Newari family of the Shahi caste and is an accomplished thangka painter. He speaks 10 different languages and has a thorough knowledge of the Buddhist and Hindu religion and mythology and the cultural customs of the Newari people. 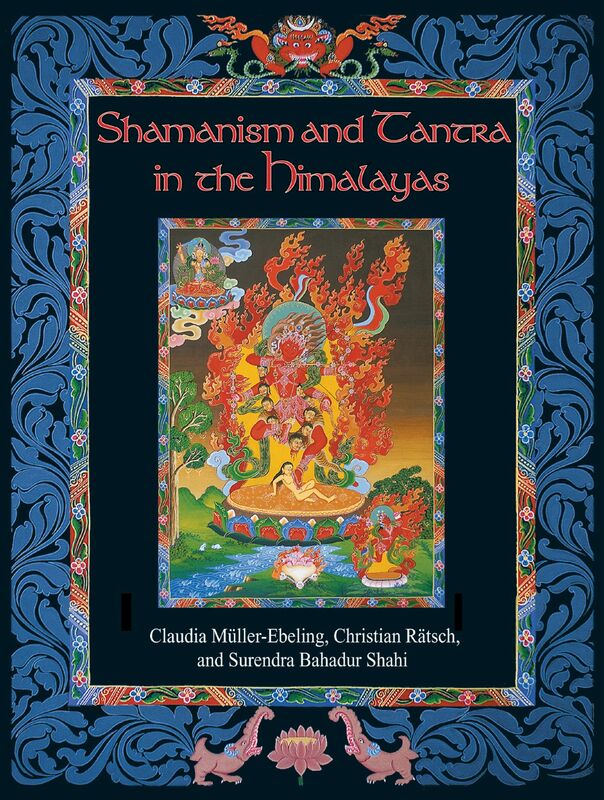 "Shamanism and Tantra in the Himalayas provides well-documented research and insight regarding the contribution of pre-Buddhist cultures to our current understanding of Tantrism and Vajrayana. The depth of detailed knowledge regarding the symbolism, rituals, and the indigenous wisdom of the Nepali shamans can be attributed to the authors’ combined expertise in the fields of anthropology, ethnobotany, art history, and ethnography. A visionary masterpiece!" "Shamanic and yogic traditions of the Indian subcontinent are closely linked together in many ways. Shamanism and Tantra in the Himalayas carefully examines the shamanic teachings of the region, along with their Hindu and Buddhist background. The book is well researched and well referenced, not merely from an academic perspective but in light of the living tradition. Anyone interested in yoga or shamanism will find a wealth of information in this fascinating book." "An exhaustive, comprehensive, no-nonsense 300 page volume--complete with photographs of shamans in action." "Beautifully illustrated, very well written, and deeply insightful." "Readers are sure to get an introduction to both ancient and modern practices that are often invisible to Western eyes." "This book is big, broad, bold, and very very beautiful, literally and metaphorically, my favorite and most functional book."